This term in the painter’s glossary denotes art made outdoors, and/or images traditionally about what one sees outdoors. Launching the artistic process outside of the sheltering studio is a liberating adventure. The act of creation is accompanied by a test of your stamina and efficiency. The sun and for that matter the world in general, do not wait for your trembling brush. As a practicing artist, I posit that what one learns through direct observation and direct execution in these circumstances makes the loss of comfort and convenience a small tradeoff. The experience truly augments the artist’s understanding and capabilities. Manifest Gallery would ask the question: what does making art outdoors do for the art itself? 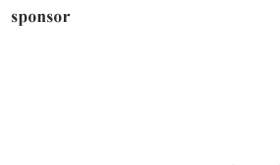 In other words, what does context of creation do to content of creation. The selection of work in this exhibition predominately reflects the traditional painting approach as well as few examples that are the result of a different examination of the question. A variety of media and supports are in evidence in this investigation. Arizona artist John Lasater submits two small oils on linen composing the cubed pattern of distantly viewed architecture cresting on a ridge or shrouded by forest abstraction. 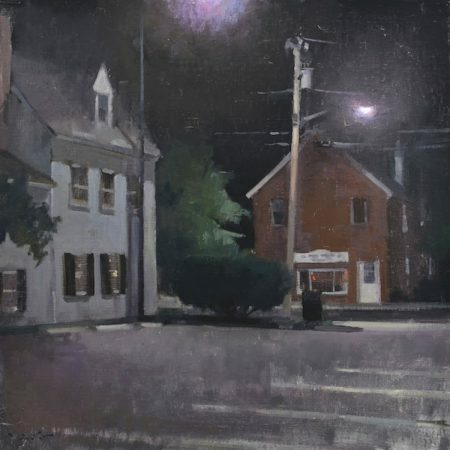 I enjoyed his third work, “Nighttime Conversation” which captures the loneliness of an anonymous American neighborhood in the glare of two street lamps. Scraping and disappearing edges keep the painting interesting and contribute to the contemporary hallmarks that distinguish it from his other works. North Carolina artist Brittany Gilbert shows eight vertically displayed same-sized panels depicting a nondescript row of vegetation with two large full headed trees. Entitled “Translucent Storms”, this episodic series depicts the traditional tri-band landscape composition with all bands being equal. Two trees and vegetation line the back edge of the foreground band and are positioned slightly left of center. The color palette varies marginally in greyed greens and purples under an agitated sky. Atmospheric conditions and weather patterns and possibly times of day are recorded with the same single broad brush throughout. Displayed like a clip of film with a half inch separation, they challenge the viewer’s capacity to sustain the same engagement that the artist commanded. Mimi Sheiner contributes “Burnt Hills”, an oil on gessoed rag paper. This vertically formatted painting is one example of several works in the exhibit employing a minimalist approach to landscape. This portrayal of two massive storage units, eclipsed by a dark olive green foreground, succeeds in contradicting the known volume of the units by contrasting their diminished shapes with the limitless expanse of sky and multiple non-descriptive brush marks in the foreground. 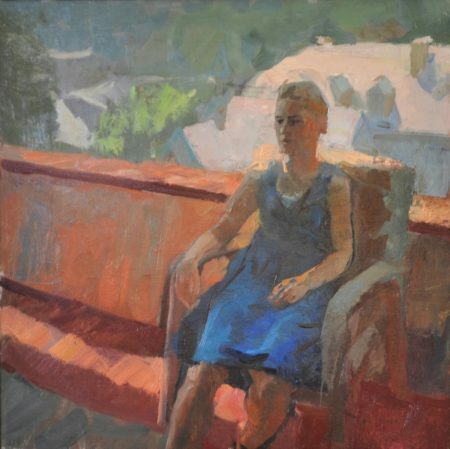 Martin Geiger’s “Abby on the Porch” succeeds in capturing a girl in a simple blue summer dress, on a red-tile rooftop veranda. In the upper third of the painting, architectural roofs of the adjacent properties are combined into a spatially abstract shape that enhances the figure’s profile. The various greens in the distance are very palatable, being atmospherically credible as well as chromatically relevant. Jesse Thomas of Portland, Oregon paints “Overlook #1”. Paint thrown from a gestural brush on a yupo support is reminiscent of Diebenkorn’s west coast landscapes. Thomas’s fresh abstraction is not contaminated by a finicky allegiance to description or detail. 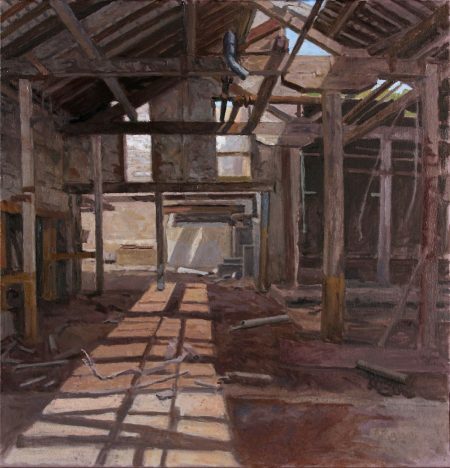 Lastly, I enjoyed Chris Ryan’s “Abandoned Factory Interior”, a square format oil on canvas. The partially razed roof reveals a stark avenue of daylight on the dirt brown floor. Twisted metal and pipes litters the desert colored floor. The palette of browns, greys and rose mauve tints are poetic and appealing when complemented with a triangle of bright blue sky. Cast shadows echo the remnant structural elements, unifying and defining the space simultaneously. Additional works may appeal to the viewer who enjoys finely detailed graphite architectural compositions. Most unique in the exhibit are four large format photographs of frozen fabric sculptures. Shot in a variety of settings, these images provoke fantasy abstractions presenting a unique answer that defies ordinary expectations for the plein air theme. Exhibited at Manifest Gallery, East Walnut Hills through Jan. 7th.